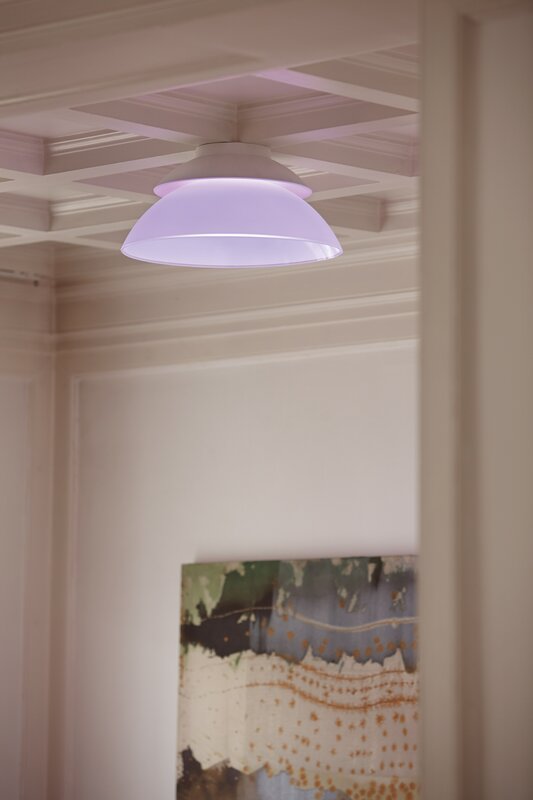 Amsterdam, The Netherlands – Royal Philips, the global leader in lighting, introduces Philips Hue Beyond, a breakthrough lamp with two connected light sources that work together at the same time. This means it is possible to have high quality tunable white light needed for everyday functional tasks at home, whilst also changing the mood of the room using colorful light to enhance the space. 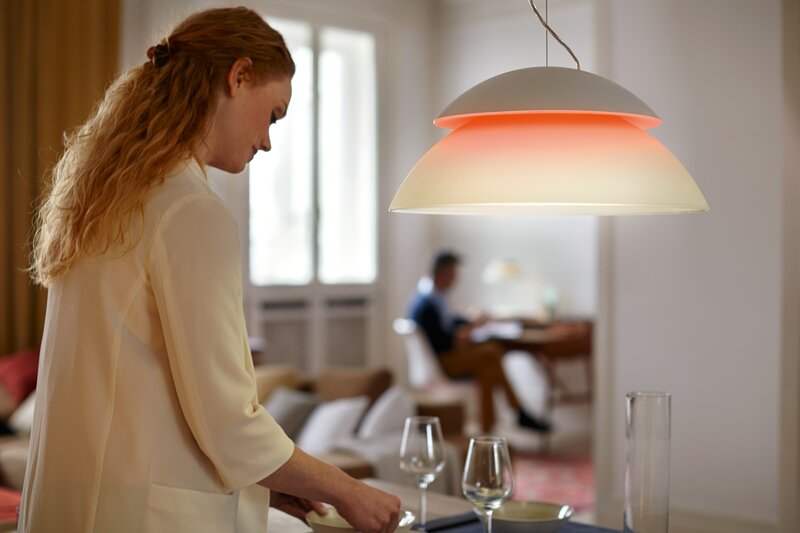 As the hottest addition to the extensive Philips Hue system, Philips Hue Beyond benefits from all of the popular connectivity features such as the light recipes and interaction with more than 190 third party apps, but with twice the light, doubling the Hue experience. Philips Hue Beyond has two light sources, an uplight and a downlight, that are both controllable separately via the Hue app using a smartphone or tablet. With Philips Hue Beyond you have the flexibility to create light that works for you; imagine having a relaxing evening ambience in your bedroom from colored light, whilst also having the perfect white light to read tuned to your ideal color temperature. The elegant table light is ideal for a home office, the pendant light is well placed above a dining table and the ceiling light is perfect for a living room – a space that gets used in many different ways throughout the day. 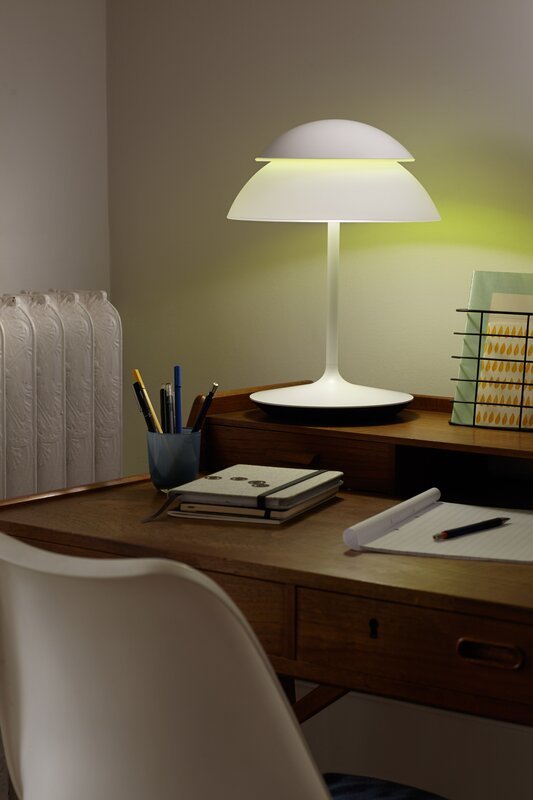 With its connectivity features, Philips Hue Beyond can discreetly alert you to a new email or change in weather via a gentle ‘light notification,’ just like Philips Hue. It also has its own intuitive interface within the Hue app to control its unique features. Select from a range of dynamic new scenes which take advantage of the two unique light sources such as ‘Paris by night’ for romance or ‘Cherry Blossom’ to wind down. 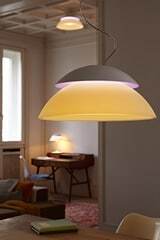 Philips Hue Beyond works seamlessly with all Philips Hue and Friends of Hue products, which makes it easy to add to an existing Hue network, allowing you to blend soft smooth tones across your home. Whether adding Hue Beyond to an existing or new network, the set-up is easy – just make sure the smart bridge is connected to your wireless network, then simply download the app to your smart device, plug in, and switch on. 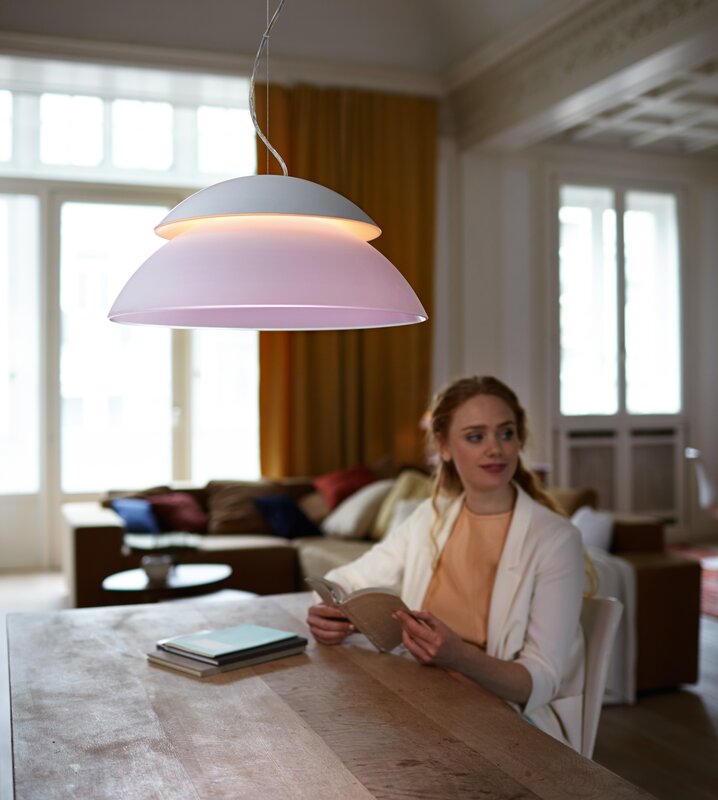 Philips Hue Beyond is available as a table light, ceiling light and pendant light in Europe and North America from September 2014. Royal Philips (NYSE: PHG, AEX: PHIA) is a diversified health and well-being company, focused on improving people’s lives through meaningful innovation in the areas of Healthcare, Consumer Lifestyle and Lighting. Headquartered in the Netherlands, Philips posted 2013 sales of EUR 23.3 billion and employs approximately 113,000 employees with sales and services in more than 100 countries. The company is a leader in cardiac care, acute care and home healthcare, energy efficient lighting solutions and new lighting applications, as well as male shaving and grooming and oral healthcare. 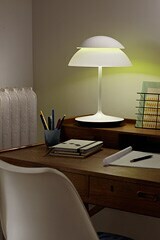 News from Philips is located at www.philips.com/newscenter.